10 minute to take taxi from Oike Station. Each room comes with a spa bath, a karaoke facility and free Wi-Fi. Free parking is provided on site. Fitted with a large comfortable bed, each air-conditioned, room has a flat-screen TV with satellite channels. A sofa and a fridge are also provided. The en suite bathroom includes a hairdryer and free amenities.Hotel Fine Rokko is a 20-minute drive or train ride from Arima Onsen (Hot Spring) area. The guests can be reached to downtown area within a 30-minute train r.
The property’s 24-hour front desk offers free luggage storage services. Drink vending machines are available.10 minute to take taxi from Oike Station. Each room comes with a spa bath, a karaoke facility and free Wi-Fi. Free parking is provided on site. 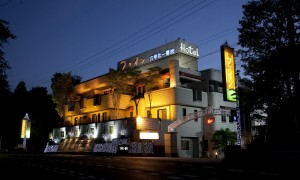 Fitted with a large comfortable bed, each air-conditioned, room has a flat-screen TV with satellite channels. A sofa and a fridge are also provided. The en suite bathroom includes a hairdryer and free amenities. Breakfast meals can be enjoyed in the privacy of the guest room when booked with a breakfast-inclusive plan. Northern part of Kobe city. Thies region is close to Arima Onsen Hot spring. Only 15 minuets from Oike station to Arima Onsen Station.Arima is the oldest spa area in Japan. Arima hot springs are natural ones that have been used since ancient times when people had no skills of digging in the ground. Presently the digging skills are highly-developed, however, they are also providing us with hot water full of natural blessings or active ingredients from near the surface (within 300 meters in depth) in the earth.Arima hot springs are rare worldwide ones containing lots of minerals and natural ingredients. There are 7ingredients, except sulfur spring and acid spring, out of 9 main ingredients (simple hot spring water, carbon dioxide spring water, hydrogen carbonate spring water, chloride water, sulfate water, ferruginous water, sulfur water, acid water, and radioactive water) designated as ones to be included for medical treatment. Situated in Kobe, this hotel is within 9 min (15 km) of Stamp Museum, Kobe University, and Fruit Flower Park. Hakutsuru Sake Brewery Museum and Sawa-no-Tsuru Museum are also within 9 mi (15 km). 1.Take Kobe City Subway Seishin-Yamate Line Sannomiya Station to Tanigami station.It takes 11 minuites approx. 2. Change the line to Shintetsu Arima/Sanda Line at Tanigami Station. 3.Get off at Oike station. It takes 5minuites apporox. The total fare from Sannnomiya to Oike is 780JPY. 4.Take Taxi to our hotel. It takes 10minuets and the fare is around 1500JPY to1 2000 JPY. Take Limousine bus from airport to Sannomiya. Then please following instruction of “How to come to our hotel from Sannnomiya Station”.